She may be gone ... but gay men are still worshiping Elizabeth Taylor. The staff at Liz's FAVORITE West Hollywood gay bar -- The Abbey -- erected a candle-lit memorial to the actress yesterday in the V.I.P. room where Liz would often hang out ... but that's only the beginning. We're told the bar's offering a special drink in Liz's memory this weekend ... and they're donating ALL the proceeds to Elizabeth's AIDS foundation. It's called the "Blue Velvet Martini" -- which they picked in honor of her role in the 1944 hit "National Velvet" -- and if you wanna try out their recipe ... it's made with Blue Angel vodka and blueberry schnapps. 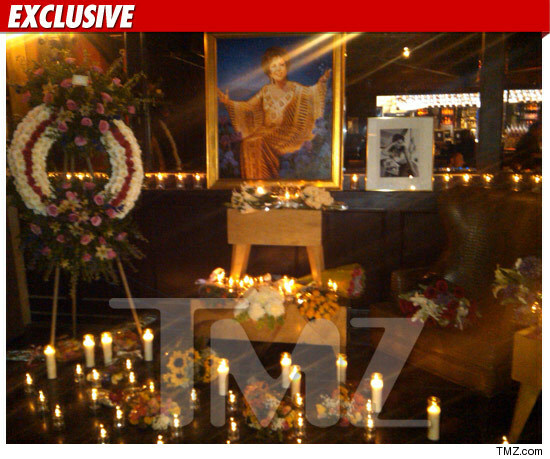 Sources at the bar tell TMZ, regulars have been adding to the shrine non-stop since Elizabeth passed -- sending flowers and gifts since yesterday morning.